2016 has come to a close, and unfortunately the story hasn't improved. 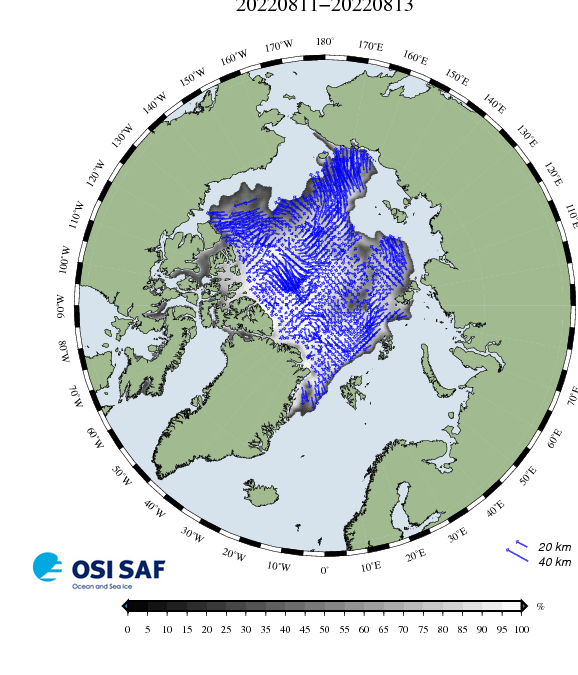 Due to a constant barrage of storms, bringing relatively warm temperatures, winds and moisture to the Arctic, sea ice still has problems forming at the edges, as well as thickening in the centre. 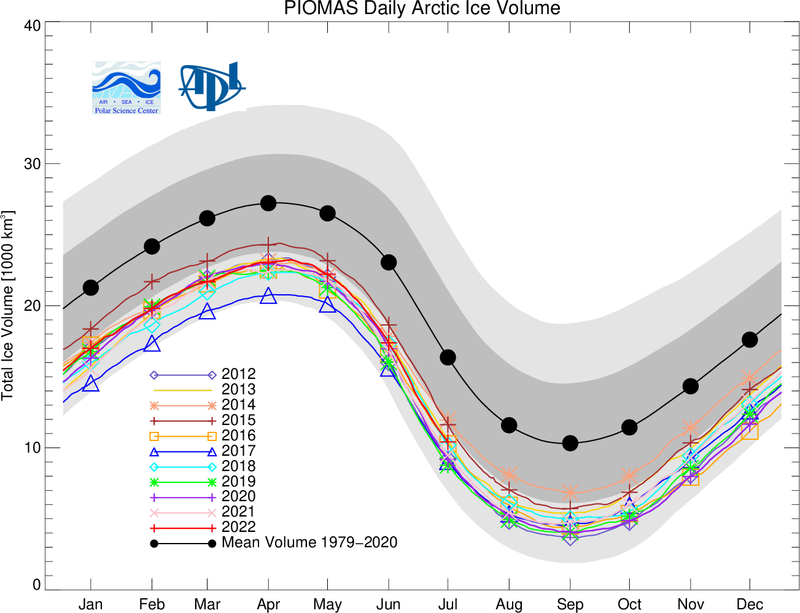 And thus the year has closed with the lowest modeled sea ice volume on record. In fact, 2016 has increased its lead over 2011 and 2012 to 1934 and 843 km3 respectively. Normally, if extent is really low, as it is now, you would expect average thickness to be somewhat higher (when compared to years with more extent), because the volume is spread out less. If there's more extent, it's usually because of a lot of thin ice on the edges, causing average thickness numbers to go up less steeply. Yes, average thickness is actually lowest on record as well. Look at the orange 2015 trend line. At the end of 2015 sea ice extent was around the same value as 2016, but, as said, there was 2664 km3 more volume, and so average thickness was relatively high. This year, volume record low, extent record low, and so average thickness record low. On average, 2016 is 20 cm thinner than 2015. That's a lot of ice. There's just no end to this run we have had with anomalously warm temperatures, and storms blowing in from the Atlantic. Maybe things will calm down as soon as global temperatures stop going up at the rapid rate of the past few years. Maybe they won't. There's nothing for it but to hope that an extreme cold spell comes in from somewhere (Siberia?) and the ice gets a chance to thicken before the Sun makes its appearance in March/April. Otherwise things will be looking more grim than ever when the melting season starts again. Sorry for not being able to give this a positive twist. Call Matt Ridley, he's good at giving the truth a taste of caviar and Cuban cigars. I'm not an expert in weather, nor do I know that much about weather patterns in the cryosphere... But I cannot imagine how a cold front could be capable of making up sea ice formation at the rate of thousands of km3 faster than normal in only a few months. There is a limit to how cold the region can get, and with so much open water it seems like that lower limit will be elevated due to higher moisture levels. Is it really possible for that kind of deficit to be made up, or are we certain to start the melt period at a record low at this point? If we're certain to start the melt season with ~million km2 more dark water rather than white ice, that would mean the waters would be absorbing an extra ~EWh of energy over the summer (!!!!!!!!). How is this not a tipping point, a permanent redraw of the maximum extent of the ice cap? Am I underestimating the potential for the growth in ice volume over the next few months, or is this a far bigger deal than what the world has so far made it out to be? Is possible for sea ice to thicken a great deal quickly only if there are no clouds and or warm air advection from the South. If a massive Anticyclone would simply remain steady over the Arctic Ocean for the next 3 months. But all recent observations makes this scenario highly unlikely because over all sea ice is thin, there are many leads, there is a great deal of heat injected from the Ocean. This "invites" Cyclones to "visit" and to persist longer ensuring more cloud cover and warmer temperatures. A few Anticyclones from the South have ventured by general circulation forcing, they did not last, they did not build up, they were constantly weakened from the sides and more importantly, from under. The possibility of a major High Pressure system moving North is always present, but they are neither "invited" nor welcome to stay long. Do you feel that we should anticipate a continued greater divergence from the norm - due to the continual venting of heat and moisture from the leads and open waters at the edge... or do you think there will be some convergence towards the mean in the next three months? You say that the high pressure systems quickly dissolve... Is there any way to anticipate a change in that trend, any signal from the weather patterns that might herald a shift, or is this just a wait-and-see issue? "You say that the high pressure systems quickly dissolve... Is there any way to anticipate a change in that trend,"
In fact yes, in mid March or then about, the ice should be as cold as it gets, and I suspect some High pressure system lasting, this has been the main trend at maxima over the last several years. It is predictable, but not a game changer. "Do you feel that we should anticipate a continued greater divergence from the norm "
Yes, look very carefully for 2 parameters, very warmer surface air temperatures and sea ice drift. The 2 are deeply related; Arctic Ocean sea ice velocities have been extremely crazy fast, at one time or another, we can conclude from this, the probable end of trekking to the North Pole in the normal about 60 days starting from land; warmer air existed even with a recent High Pressure expulsion. If there is a break from this pattern the first thing to notice is the the steadying of the drift. 1)	Previously, proper deep water formation in the Nordic seas happened when cold Arctic air masses came off the Greenland Ice sheet or off the MYI cold pool in the Arctic Ocean. Nowadays, lukewarm deep water is formed when warm saline Atlantic water hits the cold ice edge north of Svalbard and – at the same time - melts it from below. 2)	Over the past 30-40 years, marginal sea ice extent in e.g. the Sea of Okhotsk and the Gulf of St. Lawrence have gone down in line with global warming. This winter, cold continents produce thrilling temperatures which may help to grow large, but thin, marginal sea ice extents off the coastlines of North America and Asia. These two in combination have led us to the calamity we are in now. Volume is record low as Neven described and a thin veneer of thin ice at lower latitudes may lure the public to believe that everything is hunky dory. It isn’t! 3)	In Antarctica, sea ice extent was until last year growing out from the coastlines in part due to stronger Katabatic winds. Now, the upwelling of deep and warmer ocean waters and fresh meltwater close to coast is having a detrimental effect on both the sea ice and the shelf ice near the grounding line. Both of these are now melting from the coast outwards. 4)	Antarctic Foehn winds previously were sporadic phenomena of no major importance for surface melting. Now, oceanic air masses advected to Antarctica contain more moisture, hence the adiabatic heating on the upslope is bigger and thus the melting/sublimation potential on the downhill side is even bigger than before. These two in combination will also lead to accelerated melt of both shelf and sea ice from both top and bottom, which is another part of the tipping point story to be told this year. It is the un-observed parts of these changing physics, which really worries me, and the lack of documentation which makes it difficult to tell a coherent story until you actually see the ice vanish in front of your own eyes. Please pick any active thread on the forum and see for yourself how this year’s melt unfolds. Highlights the greatest reason why we have swift moving sea ice, there is very little multi-year ice left. Now we likely enter a transition sea ice period of fluid ice, easily moving in one direction or another, placing in question whether we will still recognize a long lasting Beaufort gyre or Trans Polar Stream current. We were seeing this effect (introduced storms with WV and heat) at off times during 2013 and 2014 with major shifts beginning in Dec 2015 and through 2016. If this effect was due to sea ice 'inviting' these storms then we would have seen them in the January-March of 2006, 2011, 2012 all years with similar extent coverage during this period. We did not. This is an effect that is wholly attributed to increased water vapor moving up from the tropics and being catapulted into the CAB from mid-latitudes. A SIE causality would have shown similar effects during those years with nearly identical coverage, they did not. Even so, if there was a driving factor from sea ice coverage (bringing in more storms and water vapor) the very small difference this year to the others could not account for the massive transformation we have seen this year. Indeed, the Southern Hemisphere Sea Ice also appears to be suffering from this same tropical water vapor expansion. It is simply a matter of scale, disproportionate to the slight differences in SIE (especially during the Dec-March period. "have seen them in the January-March of 2006, 2011, 2012 all years with similar extent coverage during this period. We did not." 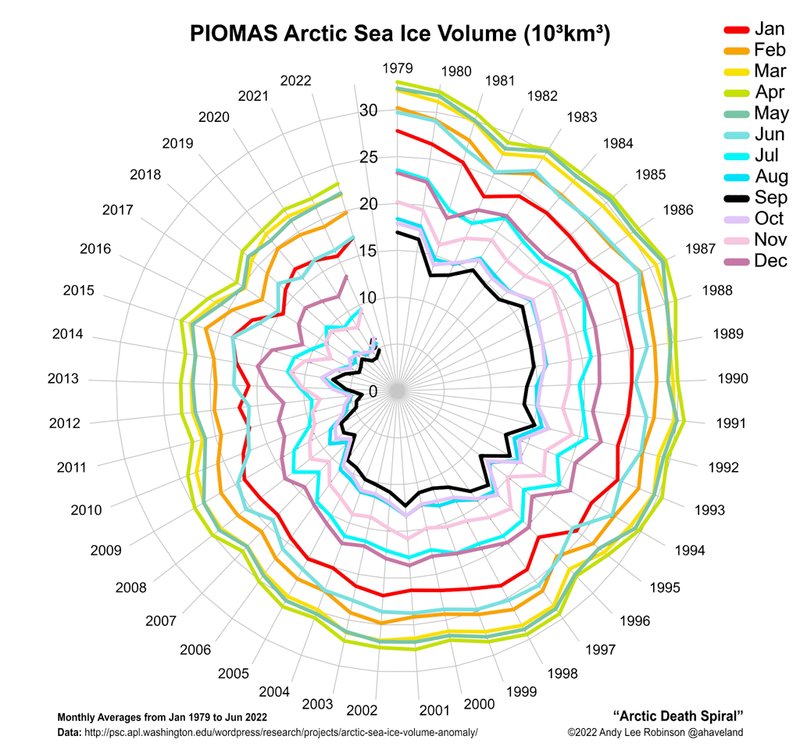 And we did have similar circulations, not with the same intensity, since even PIOMAS admits, we are at all time low volume numbers, and no, sea ice in 2006, 11 and 12 had a solid core area North of the Canadian Archipelago, unlike after September 2016. Cyclone "invitations" are done by a merge rendering system, the Cyclones linger over sea Ice long enough to merge with the next one from the South. There is more moisture as well especially this year, as seen by clouds, no doubt more heat remains near the surface by it. Antarctica is another Polar world, we need dabble with it exclusively on another blog perhaps. I think that this idea is oversimplifying the impacts of the tropical water vapor expansion that has been heavily documented (by me and others) over at the Sea Ice Forum. For the most part, these intrusions of water vapor do not form cyclonic events but merely pass on through. The scope and scale of these events this year are severely disproportional to the difference in sea ice cover and Precipitable Water Vapor increases can be solely attributed to these inflows. When they halt the TPW goes back down to about 2kg/m^2 (normal for the season). We need to be aware that there is, no doubt, an ice component, but the scope and scale of water vapor and temperature anomalies (with reduced sea ice volume accumulations) are far beyond what the meager ice differences could cause. This is especially true in the beginning of 2016 when the ice was coming off of the recovery years of 2013 and 2014 and was in very (comparably) good shape. Until the El Nino induced water vapor began to flow across and into the Arctic. "..Yes, look very carefully for 2 parameters, very warmer surface air temperatures and sea ice drift..."
How do we keep an eye out for 'sea ice drift'? Given how sharply 2013 January sea ice volume climbed, how leisurely 2017 January sea ice extent is now climbing, and current DMI temperatures, I'd hazard a guess that the gap between current levels and the previous record low may be growing still. Apologies... I hadn't checked DMI temperatures in the past week, and should note that they're now dropping a little. Still not great, mind you. This is a remarkable new record for December, tenth biggest year-to-year drops out of 440 months, and beating 2012's record low by nearly another 1000km³. December's average volume in the absence of sunlight is now less than what September's used to be just 15 years ago. If this trend continues, we're looking at a new record minimum next year. 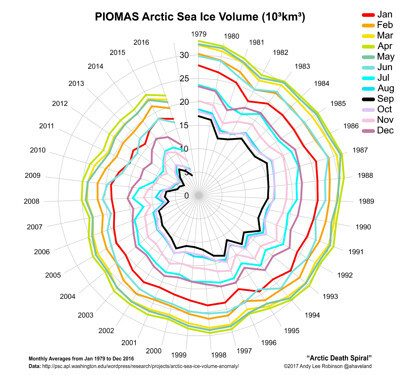 Here's my updated "Arctic Death Spiral"
Not impressively high, an Arctic standby. Are you seeing something else? 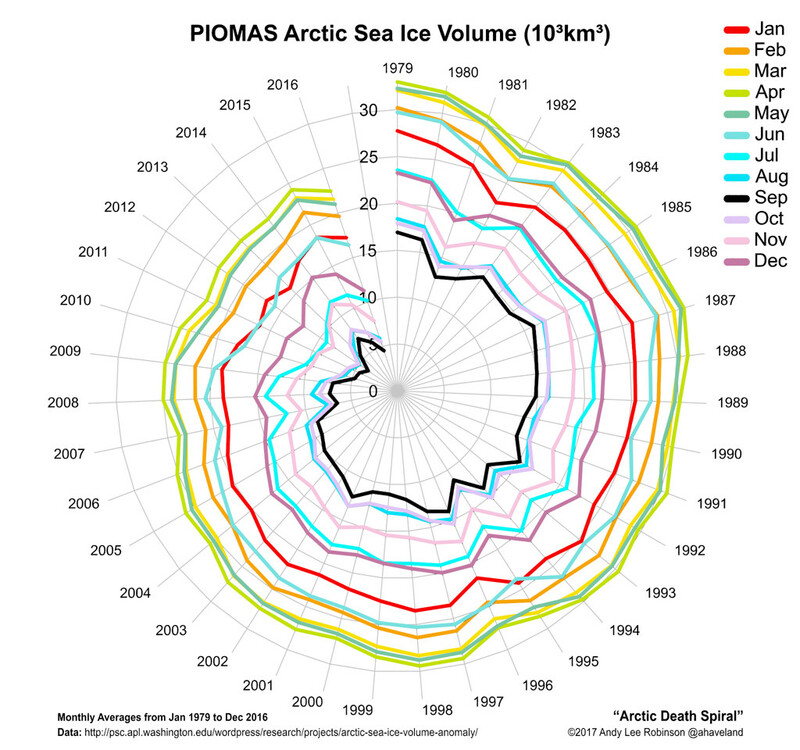 Thanks A-Team, unfortunately I can't edit the post, but I made the link exist - I forgot to add 12 to the filename to fix the image to this post, as arctic-death-spiral.png will always reflect the latest image. "are you seeing something else?" the reanalyzer does poorly for typical low arctic TPW values. They rarely go above 8kg and usually stay below 2 in 'normal' years. This has happened alternative on both pacific and atlantic sides, I see it as a function of regionally higher tropopause levels in the tropics, likely due to reductions in high troposphere sulfate emissions but also due to increased post ENSO cycle water vapor content. quotes a paper with something in the order of 129 W/m2 heat from 30 cm ice. A huge heat injection without the leads (which pump even greater heat to air in more restrained areas). If you add the greater moisture brought by these cyclones you will of course find more heat not leaving to space. I don't have any objections with believing that more moisture adds to the greater heat equation, it is part of a sum of a whole giving a net heat or temperature gain. There is an important point about water vapor at this time, there is no solar radiation at all for most of the sea ice total area during the long Arctic night. The only local heat sources are from Ocean directly or through sea ice and from the warmest point of the atmosphere, about 1000 meters ASL. Cyclones bring up heat from the South along with wind advection from far away warmer regions. Water vapor basically absorbs Long Wave Radiation coming from these sources. If we have thinner sea ice, as suggested by less sea ice volume, this would trigger greater absorption of IR. Thinner sea ice is for all practical purpose a dark sun, provenance of heat is from below and not from above, water vapor can only give more heat with more open water, thinner sea ice, or more heat advection. Less sea ice is the prime heat injector not water vapor is a feedback from this reality. What sort of a difference to albedo will replacing multi-year ice with first-year ice deliver? Thanks, Neven, for continuing posting on PIOMAS. A slight sliver of hope that the worst odds on the coming 'black swan'-event won't be that bad. First week of Januari temp anomalies were not as bad as last winter. Nevertheless, the first half of winter season was off the charts in sense of 'winter power'. "First week of Januari temp anomalies were not as bad as last winter." Very correct as usual, but general Arctic circulation is not at all like last year. I have not grasped the look of things, it seems complex. However, I would expect a few in NYC to write about 60 F on Thursday. Someone in London may like the 52 F/ 11 C tomorrow. 'Bien etrange' in Montreal to be +7 C in 2 days. Wayne, there's not much of a comparison to last year at all. Most years have a different character. First half of winter was much warmer than last year. Januari-March last year did most of the damage. So it is still open whether this year will be as bad or even worse. I wonder if there'll appear 'warm-core' anticyclones combined with SSW's. But first the train of entering Lows seems to continue. You ask What sort of a difference to albedo will replacing multi-year ice with first-year ice deliver? - It is thicker (add 0.5 m per year as a rough rule of thumb). All these factors lead to an ice that stays in the category of "white ice/snow" for much longer than FYI, which more quickly goes to the category blue ice (melt ponds) / grey ice (thin ice that lets substantial light through it illuminating the ocean beneath and permitting so solar radiation absortion). Thank you so much, navegante!